For hundreds of years in Britain, identifying yourself as a witch might well have led to your execution. Hundreds of people, the vast majority women, were either hanged or burnt at the stake for practising witchcraft until it ceased to be a capital offence in the early 18th century. Even afterwards, under the Witchcraft Act, it was still possible to be prosecuted as a witch, though the penalties were, mercifully, less severe. The Witchcraft Act was not repealed until 1951 and people were convicted under it as recently as 1944. After the repeal of the Witchcraft Act, more and more people began to openly identify themselves as witches in Britain. Some banded together into “covens” and declared themselves followers of “Wicca” – The Old Religion, also known as The Craft. This movement proved to be hugely influential and has since spread to many parts of the world. The modern history of Witchcraft or Wicca centres on the efforts of Gerald Gardner, a Briton who had travelled widely in Asia, studying native magical practices. Gardner claimed to have been initiated into a coven of witches in the New Forest in Hampshire. He later founded a coven of his own and published two books, Witchcraft Today, and The Meaning of Witchcraft, which documented rituals and helped inspire a revival of interest in witchcraft. 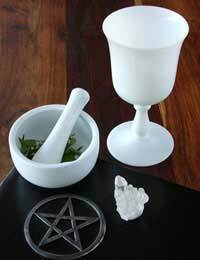 It is important to stress that there is great diversity within the world of Wicca, or modern witchcraft. There is no central authority laying down doctrine or defining rituals. Indeed, even terminology can be a matter of great dispute. Gardner’s practice of Wicca has been tremendously influential and has set the pattern for many of the modern strains of Wicca. Some claim direct descent from Gardner’s coven. There are also those who boast of a more ancient heritage, stretching back for hundreds of years. A veneration of nature; often worship of a female Goddess, and a male Horned God; sometimes also an all-powerful Great Spirit. Despite popular misconception, most witches are not Satanists; in fact, they tend not to believe in Satan, seeing this is an aspect of Christianity. The practise of rituals and spells, usually called magick. Worshippers are divided geographically into congregations called covens; and groupings of covens are called groves. Some form of initiation practice and ranking structure within each sect. The holding of services during seasonal festivals or holy days called Sabbats. The use and maintenance of a Book of Shadows by each witch – this is a blend of spell-book and personal spiritual diary. Most share the belief that the witches persecuted in the Middle Ages werepractitioners of an ancient, pre-Christian, pagan religion which modern Wicca has revived. If you’re thinking about becoming a witch, you should first of all reflect seriously on it. Most witches regard the practise of their faith as a serious spiritual commitment. If your goal is to get that cute class-mate who has never shown any interest in you to come in suddenly love-struck the next day, you may be given short shrift. Once you’ve definitely decided to become a witch, your best bet is to look for a coven where you can be given instruction by those more experienced. Finding a coven may not be easy. The practise of Wicca is not as widespread as that of the more conventional religions and, owing to lingering prejudice, most covens do not advertise their presence. Many covens try to maintain an optimal number of members, and strive to keep personal harmony within the group, feeling that this is important to the success of their magick. For these reasons, they may not be actively seeking new members. You should be aware that there may also be age restrictions on prospective joiners. Social interaction with practising witches is a good way to find out more about pagan goings-on in your neck of the woods, and perhaps gain an introduction to a coven. Modern witches are very social creatures. There are always events and gatherings going on in most major metropolitan areas. In general, the web is a great resource for discovering more about Wicca and local coven activity. Most branches of Wicca will have their own websites, offering contact details, a wealth of information about the doctrine and distinctive features of their sect, and news about correspondence courses or on-site workshops they may offer. Most covens will require a lengthy probationary period of about a year before initiation into a coven. During this time, you may be allowed or expected to attend rituals as an observer, and will be encouraged to further your own spiritual development through reading and meditation. Broomsticks are out and websites are in, in the world of modern witchcraft. Governments may be in dispute about whether or not it should be classed as a “real” religion, but there is no doubt that The Craft has attracted a large and growing following. If you decide that it is something for you, the web contains a number of great resources which will help you begin this spiritual journey. This has really helped me and I have got a coven and I will practice my rituals. I would love to become a dark witch I have already planned some curses which I will put on people who have badly upset me. and thank you I will try to find a coven. This has opened my eyes and I can now finally find where the which covers are Thankyou !